Up until now, Francesca Gregorini was probably famous, if at all, for making the movie, TANNER HALL, in which Rooney Mara took her new first name from the character she was playing. But that's about to change. 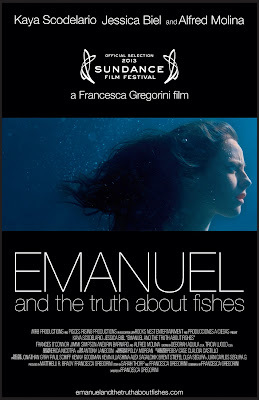 Her new film, EMANUEL AND THE TRUTH ABOUT FISHES, is absolutely wonderful - a slippery, deeply affecting psychological drama that strikes a delicate balance between profound emotion and flashes of laugh-out-loud dark comedy. The film centres around the relationship between two women - single mother Linda (Jessica Biel) and teenager Emanuel (Kaya Scodelario). Emanuel is still grieving for the death of her mother in childbirth, and resents her relentlessly upbeat stepmother Janice (Frances O'Connor). She is, however, drawn to a boy she meets on a train, Claude (Aneurin Barnard), in a situation that could be a sick-making meet-cute but which actually works. And she is, fatefully, drawn to Linda. In a first-act twist which most will see coming, we see the two women bound together in a deep secret, and its desperately pathetic (literally) to see Emanuel strive so hard to keep it, while soaking up the crypto-maternal love from Linda. All the more sad, we see Emanuel's stepmother shut out of just the kind of mother-daughter relationship she craves. If all this sounds rather emo and downbeat then believe me when I say that there are moments of the darkest, most wicked humour that counter-balance the deep longing. There's also a rich seam of visual metaphor that comes together in a wonderfully moving and affecting dénouement. That the movie works at all is testament to Gregorini's delicately balanced script, that matches explicit verbal wit with scenes of desperate grief. In the hands of a less accomplished director, or worse actors, the movie could easily have fallen into B-movie melodrama, or worse still, a movie we laugh at rather than with. And here we come to the biggest surprise of all. I'd only previously seen Kaya Scodelario in Andrea Arnold's gorgeous WUTHERING HEIGHTS, and to my mind, Scodelario was by far the weakest link. By contrast, in this movie she utterly convinces as the clever, sensitive and deeply empathetic teenager who consciously chooses to involve herself in an ambiguous and emotionally treacherous situation. But the real star of the piece is Jessica Biel. Of course, I think this is Biel's best performance to date, and some might say that's a backhanded complement given the questionable quality of her back catalogue. Well, now we know that that reflects the paucity of material offered to her, rather than her talent, because in this film she takes a role that could have become a bad joke and lends it gravity and dignity. I dearly hope that this performance brings her greater opportunities because I can't wait to see what she does with them. 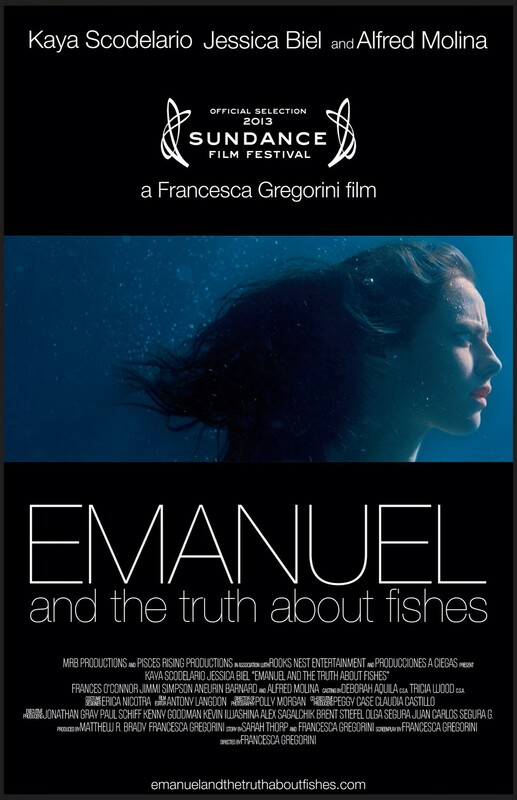 EMANUEL AND THE TRUTH ABOUT FISHES played Sundance and Sundance London 2013. It does not yet have a commercial release date.